SWIFT CURRENT, Sask. - Luka Burzan scored twice as Brandon tamed the Broncos. Cole Reinhardt's goal 7:57 into the second period was the eventual winner for the Wheat Kings (11-7-6), while Ridly Greig and Zach Wytinck also scored. Alec Zawatsky replied for Swift Current (4-19-2). EDMONTON - Parker Kelly had a pair of goals as Prince Albert doubled the Oil Kings to stretch its win streak to 18. Brayden Pachal put away the winner for the Raiders (25-1-0) at 3:54 of the second period. Max Martin, Aliaksei Protas and Kody McDonald chipped in as well. 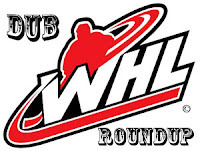 Trey Fix-Wolansky had a hat trick for Edmonton (14-10-4). CRANBROOK, B.C. - Josh Brook registered the game-winning goal as Moose Jaw topped Kootenay. Keenan Taphorn and Jett Woo also scored for the Warriors (13-5-4). Peyton Krebs replied for the Ice (7-17-4). MEDICINE HAT, Alta. - Ryan Jevne led the Tigers past Red Deer with a hat trick. Trevor Longo picked up the game-winning goal for Medicine Hat (12-12-3) at 1:48 of the third period. Ryan Chyzowski and James Hamblin rounded out the attack for the Tigers. Zak Smith and Jeff de Wit scored for the Rebels (16-8-1). KELOWNA, B.C. - Milos Roman scored the go-ahead goal 9:41 into the second period as Vancouver edged the Rockets. Dylan Plouffe also scored for the Giants (18-6-2). Nolan Foote was the lone scorer for Kelowna (11-15-1). VICTORIA - Zach Huber's goal early in the third period lifted Saskatoon over the Royals. Kristian Roykas Marthinsen opened scoring in the second period for the Blades (16-9-2). Scott Walford replied for Victoria (12-9-0) in the first minute of the third. Royals centre Kaid Oliver earned a five-minute major and a game misconduct for a check to the head at 17:45 of the second period. EVERETT, Wash. - Connor Dewar had a goal and an assist to power the Silvertips past Portland. Sean Richards knocked in the winner for Everett (20-7-1) at 15:27 of the second period, while Reece Vitelli and Martin Fasko-Rudas and also scored. Cross Hanas scored for the Winterhawks (14-10-2). SPOKANE, Wash. - Bailey Brkin stopped all 27 shots he faced as the Spokane Chiefs blanked the Prince George Cougars 4-0 on Wednesday in Western Hockey League action. Riley Woods scored twice, including the eventual winner, for Spokane (14-8-3), while Adam Beckman and Cordel Larson also scored. Taylor Gauthier turned aside 27-of-30 shots for Prince George (10-13-3). The Chiefs went 0 for 9 on the power play and the Cougars were 0 for 4 with the man advantage.